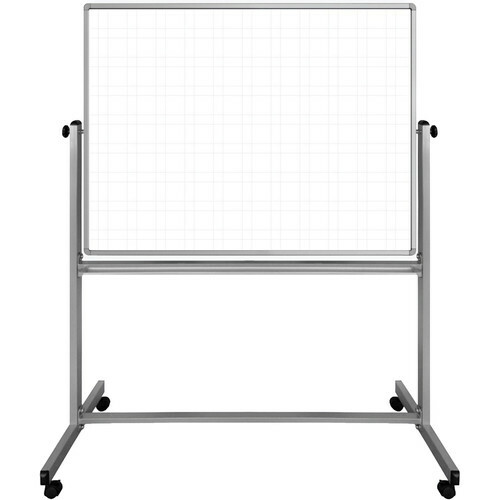 48 x 36" 72 x 40"
Create professional-looking graphs and columns with the 48 x 36" Mobile Magnetic Double-Sided Ghost Grid Whiteboard from Luxor. Featuring a 2 x 2" ghost grid pattern, this mobile whiteboard makes it easy to share information visually in schools, businesses, and manufacturing environments. The painted steel dry-erase surfaces provide a smooth writing finish that resists stains and ghosting. Two rolls of whiteboard tape are included for creating straight lines without drawing attention to the grid lines. The Ghost Grid Whiteboard maximizes space with its reversible design and has four rolling casters (two with locking brakes) for easy mobility. It is surrounded by a sleek aluminum frame and has a built-in marker tray. Moreover, the whiteboard's surfaces are magnetic so they double as bulletin boards, allowing you to easily display printed documents and notes. Included in the package are mounting brackets and hardware.